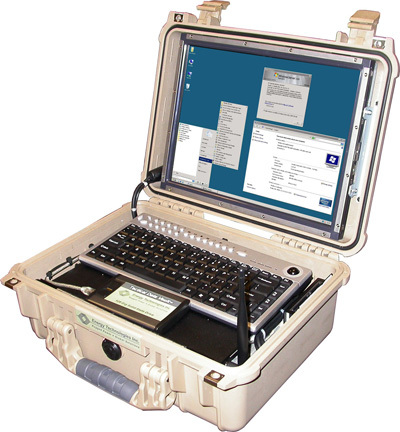 When duty calls but the onslaught of computer and paper work follows you out into the field, ETI's Tactical Field Office and Computing solutions will allow you to continue your vital work while in the field with a complete modular system providing the convenience of a modern office, yet is deployable worldwide at a moments notice. These rugged computers are configured to meet your tactical needs. We also offer a number of vital components including chassis, motherboards, SHBs and backplanes. Tactical Desk™ - 1, 2 or more personal workstations that fold up into small cubic shipping containers including all Tactical Field Office options. Desks also includes rugged folding chairs and optional equipment. 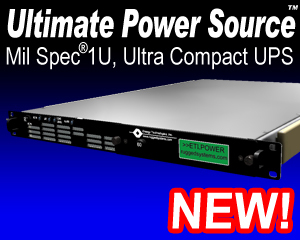 TacticalPower® Conditioner or UPS- Built-in unit for AC or DC power input produces computer grade power with or without battery backup, takes any available AC and/or DC power and produces computer-grade power with or without intrenal batteries. equipment, i.e. computers, notebooks, comm gear. Notebook PowerStation™ - a slide tray to support a notebook computer at the correct height for comfortable keyboarding or as a convenient place for a portable printer. Tactical Task Light™ - easily positioned, energy efficient LED lighting with adjustable intensity to illuminate your work space. Tactical Solar® Panels and Chargers - rugged, flexible folding solar panels & chargers to recharge battery backup. 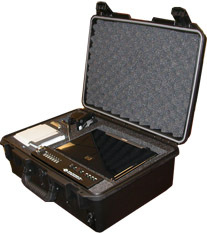 Tactical Computer Workstation™ - optional rugged built-in or portable state-of-the-art computers. 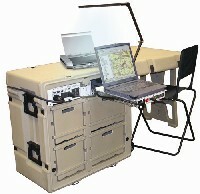 ETI's Line of Tactical Computer Workstations (TCW) are designed to reliably operate in harsh environments, from AC or DC power sources or internal batteries. 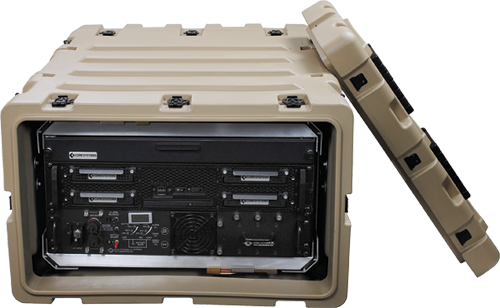 ETI's Line of Tactical Computer Powercase (TCP) are designed to safely store your equipment and provide power backup in harsh environments.